Effortlessly remove old turf with this great machine. 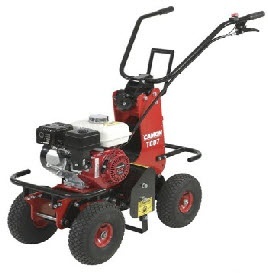 Designed and manufactured by Tracmaster, the CAMON TC07 Turf Cutter is a highly effective self-propelled machine that will cut a 30cm / 12 inch wide strip of turf cleanly, quickly and effortlessly. This outstanding machine is the ideal aid for gardeners and contractors who are looking to landscape an already turfed area, and is the perfect tool for removing turf prior to laying artificial grass. The CAMON TC07 Turf Cutter is very simple to use. The machine features a gearbox drive system which, through a chain, provides an extremely positive drive to the rear wheels. This ensures that even in difficult ground conditions the CAMON TC07 Turf Cutter will keep driving forward. The required cutting depth is easily achieved with the height adjustment on the front of the Turf Cutter and can be adjusted from 10mm to 35mm. You can use a Turf Cutter at any time of the year although we wouldn't recommend using the machine if the ground is particularly hard, ie following a long dry spell. Supplied with a 5 year domestic warranty and a 2 year commercial warranty.